LaVerne has always been supportive of my marriage to Jill. I’ll never forget the courage it took for me to ask her for Jill’s hand in marriage… it spanned two evenings and a couple of hours each. Finally, when I got up the courage to ask she smiled and simply said, “I think that would be O.K.”. I have many great memories of LaVerne. LaVerne, Jill, and I would never miss an episode of Dallas when we were first married. She was a great cook and I had many meals at her table. I enjoyed the car rides we would take when the leaves began to turn each Fall. Also, I’ll never forget the many Christmas’s we spent at her house. I believe there was only one year in the last thirty-five that we didn’t stay over on Christmas Eve. Godspeed LaVerne… I love you and I will miss you greatly! A Tribute to My Mom, My Friend, My Example, My Hero! Let me tell you a little bit about my mom as I know her. She loves her family, her home, her yard and the sun. She loves Christmas, the 24th of July, having parties, her neighbors, and her friends. She loves the mountains, warm quiet nights, the stars and sunsets. She loves her kids, her grandkids, her great-grandkids, her parents, her brothers and sister and her heritage. She loves making chili sauce for Heath, making rice pudding for everyone, and making fudge at Christmas, but only at Christmas; fruitcake on Christmas and Thanksgiving. She loves bragging about her grandkids, watching them perform; mostly in sports. The new babies, little kids, and reading to little kids. She loves to read good books, eat good food, and her job whatever it is at the time. She loves to travel, watch Magnum P.I., the news and weather, and Tom Selik. She loves to feel good and do good! She hates lightning, thunder, wind, and storms in general. She hates being at Lake Powell in a storm. She hates commotion, chaos, and bad traffic. She hates doctors, rest homes, and Relief Society! She hates Jay Leno, Martha Stewart, sad shows, and scary shows. She hates to have her house key get lost, her house a mess, filling out papers and being late. She hates wars, especially WWII, being older than 39, and rich sweet foods; unlike her kids. She hates the really cold weather, the fog, icy roads, the canal road, and any dirt roads. She hates stress and choking kids. She must hate baking cookies because she never baked cookies; and if she does, she won’t let you eat them. She believes in the Gospel of Jesus Christ, in looking at the brighter side of things, and in being happy. She believes O.J. Simpson is innocent, that President Clinton and President Nixon got a bad rap. She believes in being honest and true, and being a good neighbor. She believes in being self-sufficient and doing your best. She believes in her family; each and every one of them. She believes that the Fall leaves at Covered Bridge Canyon get prettier and prettier every year. She believes most people are good, Duane is perfect, and the tinge in the air starts about the 24th of July. I believe in my mom! I believe she is the greatest woman to have ever lived on the face of the Earth. I believe the world is a better place because of her, that she will go straight to heaven, and that she will live to be 100 years old. I believe my dad is building her a mansion in Heaven. And I know I am lucky to be her daughter and my kids are lucky to have her as a grandmother. Happy Birthday! I love you, Mom! I wrote that for her 80th birthday but a few things have changed over the last 17 years. She hated wheelchairs, walkers, and waiting rooms. She hated having to sell her car. She hated not having her body as strong as her mind. She hated being a little old lady. She loved Wednesdays and Fridays when Carma and Ron would come and clean her house and get her any kind of lunch she wanted. She mostly enjoyed Chinese or fish and chips. She loved long rides around the lake, to drive through the new developments in Salem, and a lunch date with Duane and Julie. 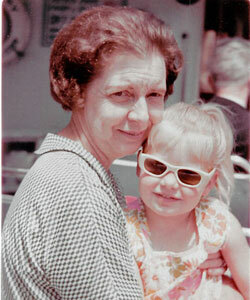 She loved a telephone call from Diane every single day and month-long visits when she was not feeling well. She loved drop-in visits from grandkids every single day. She loved a trip to Costco for a hot dog with me. She loved her produce! She would only eat tomatoes and cantaloupes from Salem, and she would only eat Harward’s corn. One day she bought a bad watermelon and she made Steven take her to the store to take it back. She told the produce guy her dad would have been embarrassed to sell products like that. I just want to tell a few stories about growing up. I would wake up in the morning to a hot bubble bath, clothes neatly ironed and laid out, a grapefruit cut and sectioned, a bowl of “Life” cereal, a few dollars on the counter; and on appropriate days, the keys to her car. Then there were the good mornings when she told me to look out the bathroom window and there was a brand new red white and blue Suzuki electric start snowmobile. Yes, there happened to be snow on the ground that day. We drove it all over town. Another good morning would be when I woke up to tickets to Disney World in Florida. I had a lot of good mornings with her. I am pretty sure nobody told Mark how I was used to waking up. Also, I can’t talk about my childhood without mentioning my Honda Trail 70. She drove into the trees the first time she rode it. She and it was so much fun! And I just love each and every one of my family! Death takes everything but the stories. 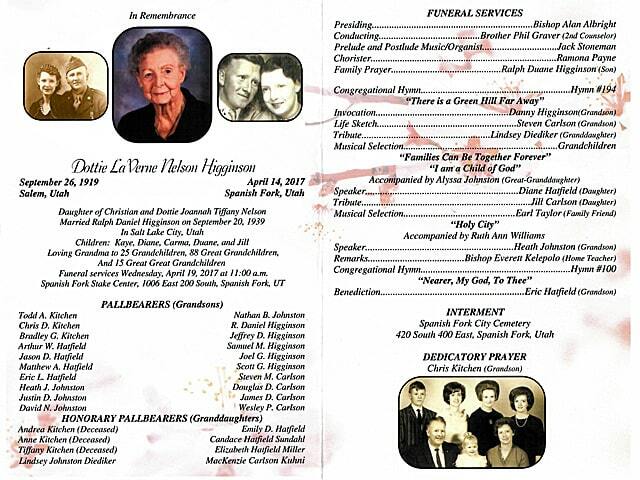 After enduring to the end, our dear mother, grandmother, and great-grandmother, Dottie LaVerne Nelson Higginson, 97, passed away on April 14, 2017, at her home in Spanish Fork. 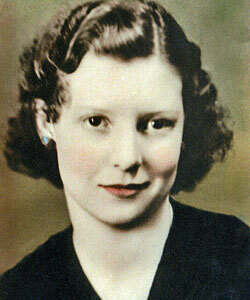 LaVerne was born to Christian Nelson and Dottie Joannah Tiffany Nelson in Salem, Utah, on September 26, 1919. She graduated from Spanish Fork High. She married Ralph Daniel Higginson on September 20, 1939, in the Salt Lake LDS Temple. Together they had five children: Kaye, Diane, Carma, Duane, and Jill. LaVerne was well-known in Spanish Fork through her employment at Wil’s Foodland grocery store, where she worked for many years. And she very much liked being a Kindergarten Grandma at Park Elementary and Canyon Elementary schools for 18 years, retiring at age 92. She was a member of the Beta Thalian social club for 70 years. 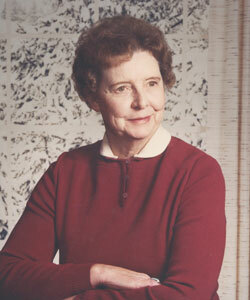 She liked snowmobiling and throughout her life has enjoyed traveling. An active and faithful member of The Church of Jesus Christ of Latter-day Saints her entire life, she served in the ward Young Women’s Presidency as well as the stake Young Women’s Presidency. She was a visiting teacher for over 70 years. LaVerne is survived by three daughters and one son: Diane (Arthur, deceased) Hatfield, Carma (Ron) Johnston, Duane (Julie) Higginson, and Jill (Mark) Carlson. 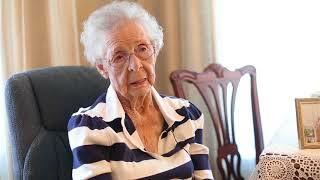 She also has 28 grandchildren, 88 great-grandchildren, and 15 great-great-grandchildren. She was so very proud of her posterity. She is preceded in death by her parents; her husband, Ralph Daniel Higginson; a daughter and son-in-law, Kaye and Arden Kitchen; granddaughters: Andrea, Tiffany, and Anne Kitchen; granddaughter-in-law, Camille Hatfield. Also preceding her in death are her brothers: Ervin, Frank, Clark; and sister, Mae Hales; and her sisters-in-law: Ruth Lewis and Phyllis Ashby. Funeral services will be Wednesday, April 19, 2017, at 11 a.m. at the Spanish Fork LDS Stake Center, 1006 East 200 South, Spanish Fork, Utah. Family and friends may call on Tuesday evening, April 18, 2017, from 6-8 p.m. at the church; and also on Wednesday morning at the church from 9:45-10:45 a.m. prior to services. Interment will be at Spanish Fork City Cemetery. The family expresses special thanks to Heather Lyman of Maple Creek Hospice for her loving care of our mother. Condolences may be sent to the family at www.walkerobits.com. Image and Obituary – Rich Snippets image and Obituary: LaVerne N. Higginson, Herald | Media heraldextra.com, 16 April 2017, online archives (http://www.heraldextra.com/lifestyles/announcements/obituaries/laverne-n-higginson/article_a01212fe-9b4d-5388-9a5d-1578c8bce1f2.html: accessed 27 July 2017). 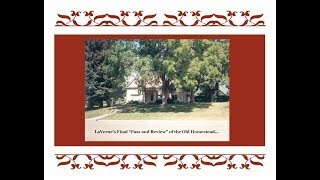 Music – LaVerne’s Final Pass and Review of the Old Homestead: The King’s Own Scottish Borderers Military Band. “Amazing Grace.” 22 Sept. 2009. MCA Records. Ralph and Laverne: Amy Grant. “Heirlooms.” 27 Sept. 1987. Billie Holiday and her Orchestra. “When A Woman Loves A Man”; “The Complete Billie Holiday on Columbia CD 4.” New York City, NY. Anne Murray. Bing Crosby. “Danny Boy.” Top O’ The Morning / His Irish Collection. Josh Groban. “You Raise Me Up”; “Closer (U.S. Version)”. Billy Dean. “Once in a While”; “The Very Best Of Billy Dean.” Nashville, TN. 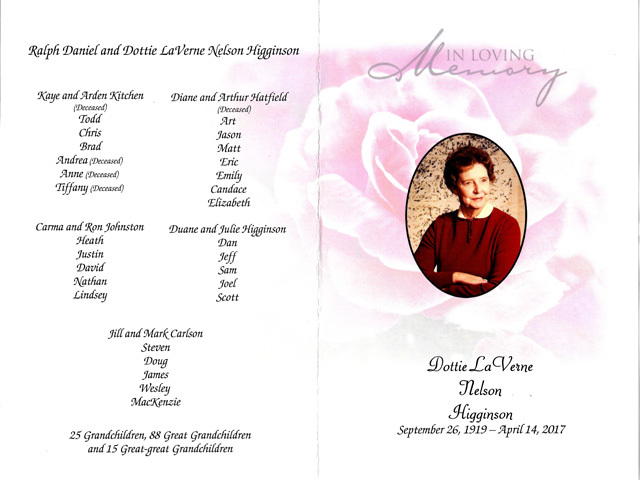 In Memoriam Dottie LaVerne Nelson Higginson - LaVerne passed away peacefully at her home surrounded by family, on April 14, 2017, at the age of 97.